Home to more world-class golf courses than any other region in the world, the coveted Monterey Peninsula is legendary amongst golf enthusiasts. The Monterey Peninsula sits off the beaten path, framed by the Pacific Ocean, providing a quaint setting while preserving an old-world charm. This is your opportunity to experience legendary golf, fulfill your dreams and create life-long memories! 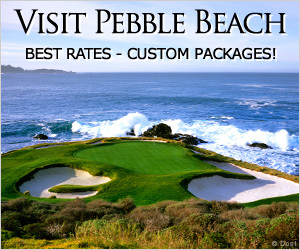 Monterey Peninsula Golf specializes in creating personalized golf packages, encompassing the enchantment of the region. We leverage our knowledge and relationships to save you time and money. Our certified specialists (IAGTO) manage all aspects of your golf and lodging, incorporating your specific requests into a package you will remember for a lifetime. Our relationships with local golf and lodging establishments affords us the ability to book premium tee times and accommodations at prices not offered to the public. Utilizing 20 years of experience on the Monterey Peninsula we are able to recommend golf courses that align with your vision, accommodations that fit your lifestyle, restaurants that entice your taste-buds and activities that bring you closer to the mystique of the area. Our professionals cater to individuals and groups of all sizes. We look forward to helping you plan your next vacation to the legendary Monterey Peninsula. What dates are you planning for your vacation? How many golfers are in your group? How many rooms will you require? What type of rooms would you like, single or double bed?